I’m trying to rush spring along, but the chill in the air still tells me otherwise . . . The only hint of spring in my produce market are fresh ramps. 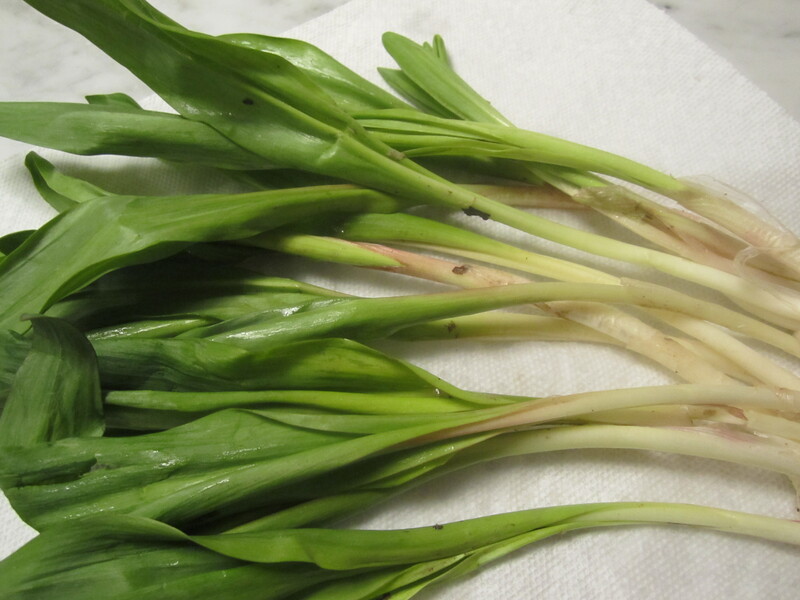 Ramps are labeled “wild leeks” at my produce market, but actually, they’re more like wild garlic. When I cooked with Mario, we made the simplest of pasta dishes with sliced garlic, ramps, olive oil and a touch of chicken broth, over dried fettucine. It was like pasta with garlic and olive oil, with the garlic flavor amplified by the ramps. Since then, whenever I see ramps, which appear for a very short time in early spring, I always buy them and make some version of this dish. The ramps should be rinsed and separated into two pieces–the lower stem, including the bulb and white part, and the long green leaves. The bulb portion should be sauteed for several minutes, like a clove of garlic; the leafy greens can go in 30 seconds prior to the completion of the dish–they are mild. Tonight, I’m making the dish heartier with the addition of ham. Ham has that wonderful salty, slighlty smokey flavor, but it’s not as overpowering as bacon or pancetta. 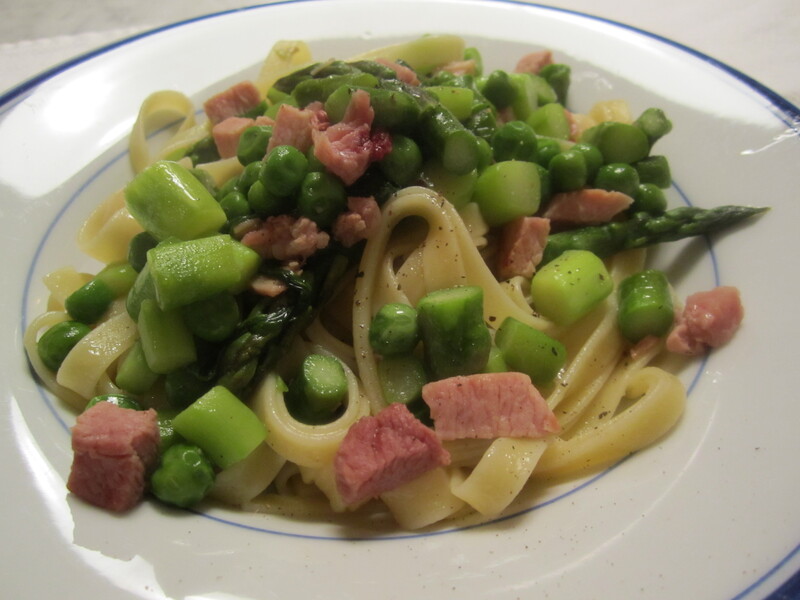 Asparagus gives the dish an additional earthy note of springtime (although they’re not local asparagus yet), and peas are always good wherever ham goes. Try this early spring dish and omit the ham if you want, but tonight it’s our main course, so I wanted to give the dish some protein. Boil a pot of water large enough to hold the pasta, then add a generous pinch of salt. Begin by preparing the asparagus. If you’re using fatter asparagus (in the case of asparagus, fatter is better than thinner), you can either peel the lower portions of the spears with a vegetable peeler, or simply bend the spears and let them break where they want, then discard the lower portion of the spear. I prefer to peel the spears, which takes about the same amount of time as it takes for my pot of water to boil. Cut the spears crosswise into 1/2″ pieces and drop in salted boiling water for about 3 minutes. Drain and set aside. 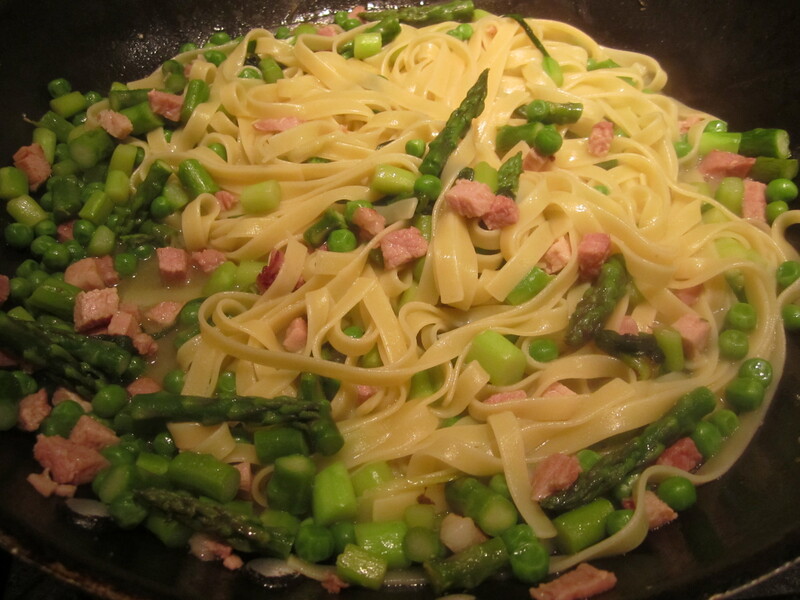 Begin boiling the pasta in the asparagus cooking water–stir frequently. While the pasta cooks, in a broad skillet large enough to hold the pasta, on medium heat, saute the whites of the ramps in the olive oil and half the butter for about 3 minutes or until they are wilted and beginning to turn golden. Add ham cubes and continue sauteing for another minute. 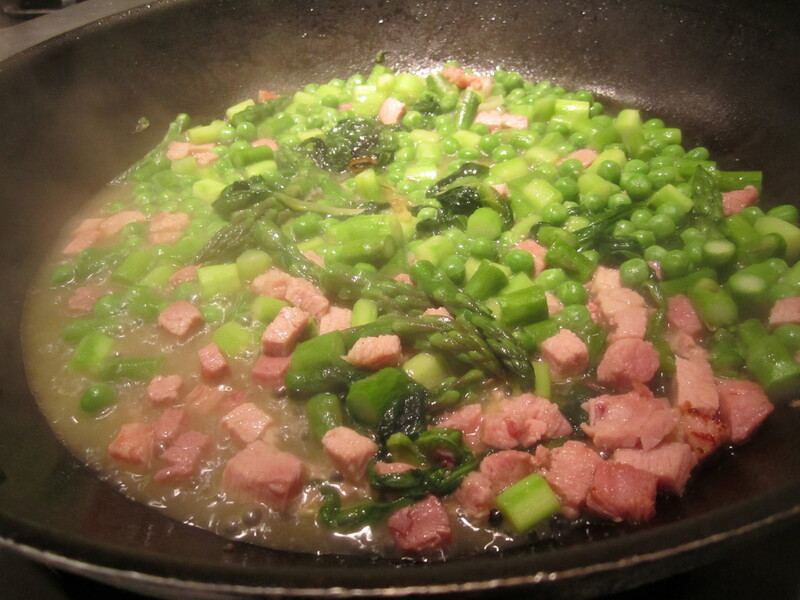 Add asparagus and peas and saute for another minute. Turn up heat and add broth. When pasta is about a minute shy of done, add to skillet with the vegetables. Add a couple of tablespoons of pasta cooking water and the remainder of the butter. Toss and saute for a minute, stirring constantly. Taste for salt and add salt and pepper, if necessary. Serve with plenty of grated parmiggiano at the table.